In what has become an all-too-familiar scene, America watched another of its cities erupt in protest this week, after yet another young black man died after interacting with police. This time the city was Baltimore and the victim was 25-year-old Freddie Gray, who suffered a severe spinal injury while in police custody on April 12. Within a week he was dead, and two weeks later his family still has not gotten answers or justice. Despite this unconscionable tragedy—in a year filled with unconscionable tragedies involving police and black communities—our news media has done nothing but smear and condemn protesters, rather than ask important questions about the systemic conditions that created this conflict. 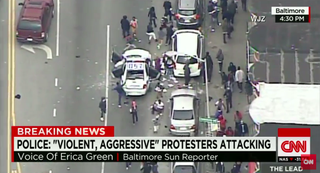 Fox News anchors—and even the mayor of Baltimore herself—described Baltimore as a city under siege by “thugs.” CNN wondered repeatedly why there weren’t more police on the ground. Politicians, commentators and the Baltimore Police Department strongly and repeatedly urged “calm” and have since called the protests “counterproductive,” despite the pain, disrespect and injustice this community has been forced to endure. Violence is never the preferred reaction. But responsible journalism doesn’t simply focus on the results of years of oppression—a community that finally reaches its breaking point—but on the factors that led to the break. The dismissive, dehumanizing media coverage around the Baltimore uprisings has instead relied on tired archetypes of thuggery and ignorance, precisely the kinds of stereotypical characterizations that reinforce biases, leading to tragedies like the death of Freddie Gray. What community wouldn’t erupt under such conditions? Is it really that hard for so-called journalists to report that story accurately? I lead an organization that has shown up again and again to communities suffering tragedies at the hands of police violence, and time and time again, we see absolutely no accountability. Just more finger-pointing from a corporate media more interested in property than in my people. There is very real potential right now to build lasting change from the Baltimore uprising. We don’t need the National Guard or the heavy-handed tactics of an overmilitarized police force. We need policies that will improve conditions in these communities and bring real-world structural changes to policing that will protect the human and civil rights of black people in Maryland and nationwide. We need real progress, change and healing, or we’ll never get beyond the violence and injustice of this moment to realize the promise of our democracy. And we need a media landscape that presents fair, humanizing coverage of black people. Because despite what your favorite 24-hour news network might say, what we are witnessing is history in the making across this nation: Oppressed communities of color from Ferguson, Mo., to Baltimore are demanding that their voices be heard. The real question: Is America finally listening?